You may know her as Janet Bayne (U.S. Senator Paley's Chief-Of-Staff) on Showtimes's Homeland. Or maybe as Graff on Billions. But, you may not know that actress Ellen Adair is a baseball fanatic—and she's even a little smitten by the Red Sox. We were lucky enough to gain an interview with Ellen recently to explore what she calls her "unhealthy love of baseball". Thanks to her family upbringing—which fostered an elemental love of baseball—Ellen adopted a multi-lateral fan philosophy. She calls it her "complex flow-chart of baseball allegiances." 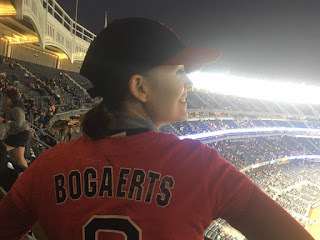 Basically, she believes that a pure love of baseball can allow a person to root for multiple teams—while still holding a supreme loyalty to only one. In Ellen's case that one is the Philadelphia Phillies of her childhood. But, she also spent seven years in Boston, part of that time getting a degree in English and Theatre at Boston University. 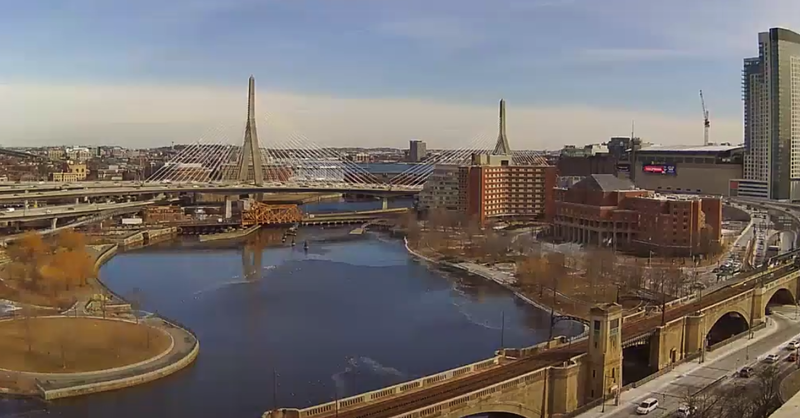 Being so close to Fenway—as she says, "bathing in the light of the CITGO sign"—she was swept up in Red Sox fervor. She became smitten with The Carmine Hose—hey, who wouldn't? In fact, she calls the Red Sox her "gateway drug"—allowing her to root for a team other than her 'Life-Partner' Phillies. As she says, "I blame the Red Sox for being so lovable that I felt I could root for another team". Her years in Boston overlapped—to varying degrees—with all three recent championships (2004, 2007, 2013). 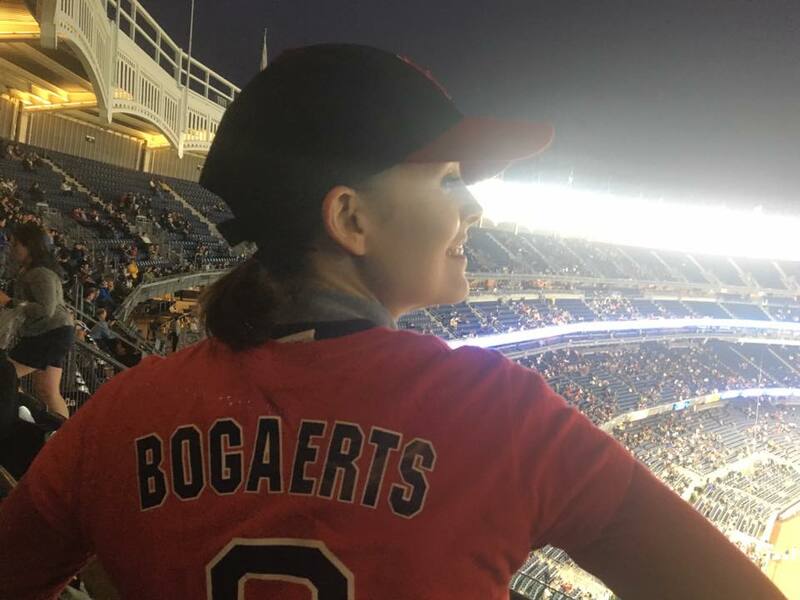 Perhaps because she was a softball catcher herself, her favorite 2004 player was Jason Varitek—she says proudly, "I'm a 'Tek girl". Through the years, she's also been taken by Kevin Youkilis, Curt Schilling, Jonathan Papelbon, Jon Lester, Stephen Drew ("He had such panache in the field, but then he was such a Charlie Brown character at the plate"), Shane Victorino and—on the present team—Xander Bogaerts and Mookie Betts. Maybe not coincidentally, a few of these players also wore Phillie laundry at one time or another. And, while she loved Schilling and Papelbon as players, she now has some mixed opinions about them in their post-playing days. Making it easier to root for the Red Sox was the shared hatred of the Yankees. In addition to her Mom and Dad instilling a love of baseball, they also imparted an ingrained dislike of all-things Yankee. Residing in New York over the past decade, Ellen has bravely worn Red Sox gear to The Concrete Bunker On 161st Street (see photo above). She gets harassed, but she gives back as good as she gets. While Ellen's acting career has been very successful (in addition to Homeland and Billions, she's also appeared on The Slap, Veep and Nurse Jackie), she's never been in a baseball-related role. 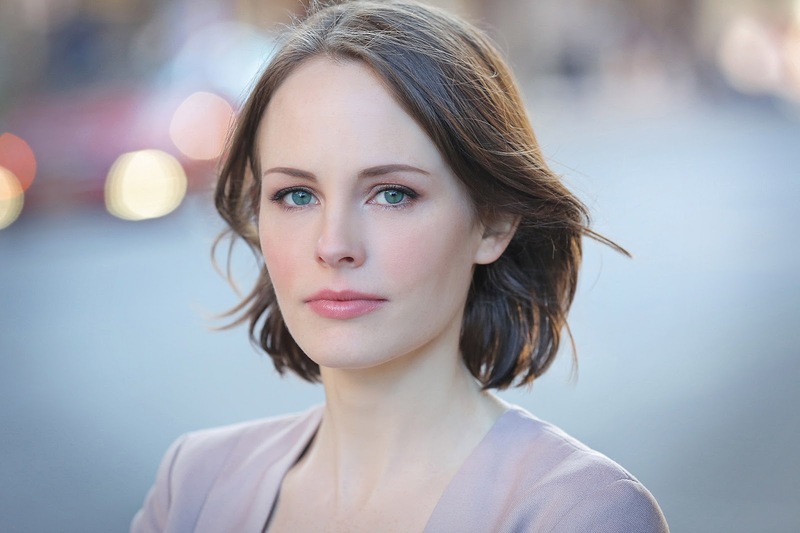 She's trying to change that by helping develop a TV series about sportswriters. Ellen's enthusiasm for baseball is absolutely infectious—she can rattle off players and their stats like it's second nature. And, in fact, it is. She's even thinking of producing a t-shirt emblazoned with, "Ladies Love Plate Discipline". How cool is that? 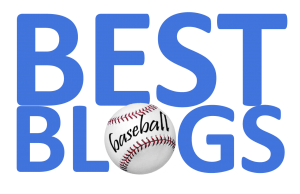 So, the next time you see Ellen Adair on your favorite show, remember that lurking beneath that great performance is a true baseball fan—just like every one of us.